With our free small utility you can automate process of cleaning of your Recycle Bin. Usually, user should delete the contents of Recycle Bin manually, but our app lets you automate process using several rules. For example, the program can delete items in the Recycle Bin after specified period of time. Remove large items earlier, and keep small items for a longer time. Thus, you will be able to keep more items in the Recycle bin. 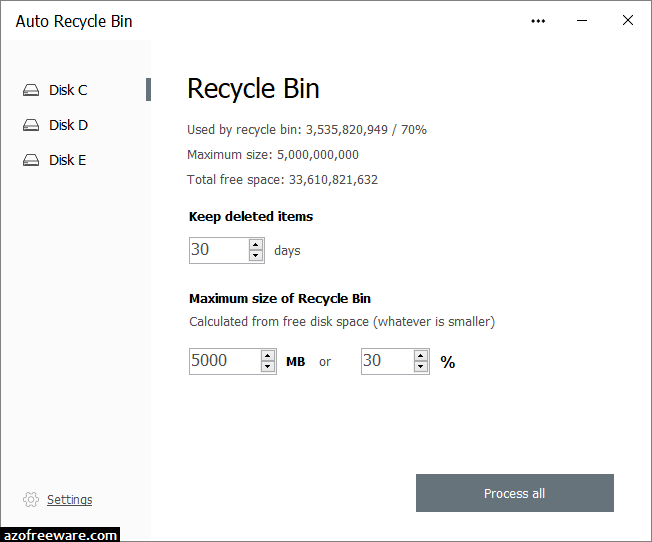 Also, our app will control size of Recycle Bin depending on the free space of your disk. This is also convenient, because Windows OS provides only one option for fixed size only.